The ensemble Contrpunctus begins a series of recordings featuring great Latin Tudor works compiled by John Baldwin in the late 1570s at the St. George’s Chapel in Windsor. 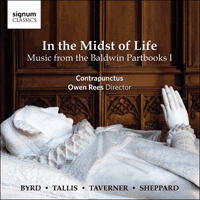 NOTE: All of the music on this program is from the recording In the midst of life: Music from the Baldwin Partbooks I featuring Contrapunctus directed by Owen Rees. It is a Signum Classics CD and is number SIGCD408. The repertory of Latin sacred works by Tudor composers is one of the musical glories of the Renaissance, but the survival of much of that repertory has hung by a strikingly slender thread, namely a few manuscript collections of polyphony compiled late in the sixteenth century, at a time when a significant portion of the music concerned had lost its original liturgical and devotional contexts as a result of the Reformation in England. This recording presents music from the greatest of these Elizabethan manuscript compilations, the Baldwin partbooks, and is the first of a series of recordings by Contrapunctus which will present a broad selection of music from the collection. This huge anthology—containing almost 170 works—was copied by John Baldwin between about 1575 and 1581, during the period that he held a tenor lay clerkship in the choir of St George’s Chapel, Windsor. Baldwin would later go on to join the most prestigious choir in Tudor England, the Chapel Royal, and as a Gentleman of that chapel he sang at great state occasions such as the funeral of Queen Elizabeth I and the coronation of King James I. He died in 1615. The Baldwin partbooks present a wonderfully rich survey of Latin-texted music composed in England over several decades, and the range of religious themes encompassed by the contents is extremely wide. Baldwin did not organise his collection by composer or by genre. Our approach in this series of recordings is twofold: first, to reflect in our selection of music for each disc the panoply of styles in the partbooks, ranging across the half century or so of musical history which is represented there; second, so that each disc is coherent, we focus in turn on several of the prominent religious themes represented in Baldwin’s anthology. On this first disc we perform works concerned with mortality: the fear of death and eternal torment, anticipation of the Day of Judgement, and the soul’s longing to meet God. The Baldwin partbooks are particularly valuable because they preserve numerous pieces which survive in no other source, and also because the repertory covers such a long period, extending back well before the Reformation in England to the music of John Taverner (d1545). Taverner—the foremost English composer active near the end of Henry VIII’s reign—is abundantly represented in the partbooks. Without these partbooks we would have lost a major portion of the work of John Sheppard (who was active in the 1540s and 1550s), including his epic Media vita which is presented on this disc. Baldwin’s collection also provides us with numerous pieces by a younger generation of musicians composing during the middle decades of the century and well into Elizabeth’s reign, such as Robert Parsons and William Mundy. However, by far the most famous composers represented are Thomas Tallis (whose extraordinarily long career stretched from the middle of Henry VIII’s reign to the 1580s) and Tallis’s pupil William Byrd. The partbooks include a great many motets by Byrd, and a copy of Tallis’s and Byrd’s joint printed collection of motets, Cantiones sacrae (1575), is bound into the end of the manuscripts. We are thus extraordinarily fortunate that Baldwin’s anthology survived (it is preserved today in the library of Christ Church, Oxford), although sadly one of the six partbooks which made up the set—the Tenor book—has been lost for some time. Since many of the pieces in the collection are known only from this source, their Tenor parts have to be reconstructed editorially, and this applies to four of the ten works on this recording: Peccantem me quotidie by Parsons, Gerarde’s Sive vigilem, Tallis’s setting of the Nunc dimittis, and Media vita by Sheppard. The task of reconstruction is made much easier when—as in most of Media vita—the Tenor carries the chant associated with the relevant text as a long-note cantus firmus, so that the modern editor can simply rebuild the Tenor part using that chant melody, and be confident that the music has thus been faithfully restored.Awareness of mortality was a constant in Tudor society, and the townscape and soundscape presented ubiquitous reminders of death. These included (to cite just a few) the tolling of funeral bells, public executions, and processions taking the body of the deceased from their house through the streets to the church for burial. In the period before the Reformation the fear of purgatory had led to a great proliferation in Requiem rites and the music associated with them. The texts of several of the works on this recording—all three of the items by Robert Parsons and one of those by William Byrd—are from the Catholic liturgies for the dead. In setting Audivi vocem de caelo, an antiphon for Vespers of the Dead, Byrd marks dramatically the point at which the ‘voice from heaven’ speaks the words ‘Blessed are the dead’, introducing these words with a startling change of harmony, and turning to chordal writing but with the topmost voice anticipating the others: his use of this specific device recalls occurrences of it in the Lamentations of Tallis and Robert Whyte and in motets by these two composers setting texts of mourning or penitence. It is possible that Byrd’s Audivi vocem, with its impassioned setting of ‘Blessed are the dead who die in the Lord’, was written to commemorate one of the Catholic martyrs executed in the early 1580s, at around the time that Baldwin was compiling his partbooks. Such use of music in support of the Catholic cause was common in Byrd’s output: although the composer served as Gentleman and Organist of Elizabeth’s Chapel Royal, and was clearly one of the most valued musicians in her household, he remained loyal to the Catholic faith, and maintained close associations with Catholic members of the nobility and with Jesuits working in England. More than any English composer of the period, Byrd was able to mould imitative polyphonic textures to project the sense of a text with rhetorical power: in his motet Circumdederunt me the prayer for release (‘libera animam meam’) when surrounded by the fear of death and damnation which concludes the piece provides a wonderful example of such music ‘framed to the life of the words’, as Byrd himself put it. The three works by Robert Parsons on the recording, Libera me Domine, Credo quod redemptor meus vivit, and Peccantem me quotidie, are all settings of responsories for the service of Matins of the Dead, and Libera me also occurs during the ceremony of Absolution after the Requiem Mass. Parsons was appointed a Gentleman of the Chapel Royal in 1563, and died by drowning in the River Trent In January 1571/2. (William Byrd succeeded to his place in the Chapel Royal.) In Libera me Domine and Peccantem me quotidie Parsons incorporates the relevant plainchant melody, laid out as a cantus firmus in equal note-values, and assigned to the Tenor in Libera me Domine and to one of the Contratenor parts in Peccantem me quotidie. It is likely that Parsons wrote these works as liturgical items, before the relevant rites of the dead were swept away with the reestablishing of the English Book of Common Prayer in 1559: although we do not know when he was born, it seems probable that he was already active as a composer during the brief reign (1553-1558) of Elizabeth’s sister, Mary I, a period when the official religion of the country returned to Catholicism. In his copy of Libera me Domine, made decades after the liturgical usefulness of this piece had disappeared in England, John Baldwin nevertheless indicated the original liturgical repetition of part of the text (from ‘quando caeli movendi sunt’) after the ‘Dies irae’ verse. Parsons likewise allowed for such a repetition in his setting of Peccantem me quotidie, but here the verse has to be supplied in plainsong, as is done on this recording. The repeated final section of polyphony includes the words ‘miserere mei Deus’ (‘Have mercy upon me, O God’), the opening of Psalm 50: like many other Continental and English composers, including Byrd, Parsons here refers to Josquin’s famous ‘miserere’ motif (with its simple but plaintive rise and fall of one note) used in his setting of Psalm 50, where the motif appears as an ostinato subject between every verse of the psalm. Parsons follows this sombre gesture with an impassioned musical outburst to highlight the final words of his text, ‘et salva me’ (‘and save me’). Parsons’ Credo quod redemptor meus vivit, richly scored for six voices, is a freely-composed motet rather than a liturgical setting of a responsory: although the concluding section of text and music (from ‘et in carne mea’) is once again repeated here, the simple ABB structure used here is one that was common in English motets and anthems of the period. In the texts of both Credo quod redemptor and Libera me Domine the believer contemplates the Day of Judgement. While in the first of these pieces the end of days is pictured with hope—‘on the last day I shall arise out of the earth, and in my flesh I shall see God’—in Libera me Domine we are presented with a frightful vision of the ‘day of wrath’ when God will come to judge the world through fire. Parsons’ setting of the ‘Dies illa, dies irae’ verse builds to a mighty climax—displaying the muscular leaping contours frequently used in English polyphony of this period—to highlight this dread-inspiring description of the end of the world. The Day of Judgement is also the theme of the text Sive vigilem (a version of a famous passage attributed to St Jerome), in which the speaker seems constantly to hear, whether awake or asleep, the sound of the Last Trumpet and the angelic summons for the dead to arise and come to be judged. Baldwin copied two settings of this text into his partbooks, composed respectively by William Mundy and Dericke Gerarde. Mundy, who may have been of a similar age to Robert Parsons, served as a vicar choral at St Paul’s Cathedral during the early years of Elizabeth’s reign, and then joined the Chapel Royal in 1564 (soon after Parsons), remaining in royal service until his death in (probably) 1591. Gerarde, a Flemish composer working in England, was associated with two of the most important musical patrons of the Elizabethan period, Henry Fitzalan, Earl of Arundel, and his son-in-law Lord Lumley, and the composer’s music is mainly preserved in manuscripts from their great collection which was held at Nonsuch Palace. The responses of Mundy and Gerarde to the dramatic nature of the Sive vigilem text are equally powerful, although Gerarde is much more expansive in his treatment of it. Gerarde highlights the sounding of the trumpet (‘sonum tubae’), while Mundy makes the summons of the angel to the dead—‘surgite mortui’: ‘arise, ye dead’—a threefold climactic exhortation, each statement higher and more commanding. The opening of Psalm 42, ‘Quemadmodum desiderat cervus’, expresses the soul’s yearning for its final meeting with God: ‘Just as the hart desires springs of water, so longs my soul for Thee, O God. My soul has thirsted for God, the living spring. When shall I come and appear before the face of God?’ A six-voice work attributed to John Taverner survives in its various sources (one of which is the Baldwin partbooks) without text, but with the title or incipit Quemadmodum, and in 1925 H. B. Collins suggested that the opening two verses of the psalm could satisfactorily be fitted to Taverner’s music, and that the piece should therefore be regarded as a vocal work rather than for instruments. In fact, although the piece seems very likely to be vocal in origin, there are passages in which it is far from obvious how best to fit the words to the music; this recording presents a fresh attempt to do so. The work is unusual among those attributed to Taverner, maintaining fully-scored, equal-voiced, and largely imitative texture throughout. The shaping of paragraphs is masterful, as for example in the rising sequential repetition of ‘ad te Deus’ towards the end of the first part, and at ‘quando veniam’ in the second. The Baldwin partbooks are the only known source for a setting by Tallis of the Latin Nunc dimittis, which is paired there with a setting of the Magnificat. The Nunc dimittis is the ‘Canticle of Simeon’ from Luke’s Gospel: the aged Simeon, having seen his Saviour (the Christ-child), expresses his contentment to die in peace. The fact that Tallis sets the Latin text rather than the English version of the Book of Common Prayer raises the question of whether his setting was composed before the reintroduction of that Prayer Book in 1559 under Queen Elizabeth, or whether it reflects the appearance in 1560 of the Liber precum publicarum, a Latin version of the Book of Common Prayer. The piece follows the common practice—in settings of Latin canticles both on the Continent and in England before the Reformation—of providing polyphony for alternate verses only, leaving the others to be chanted (as on this recording) or possibly played instrumentally. Tallis’s exuberant treatment of the text includes a particularly powerful threefold declamation of the phrase ‘et gloriam plebis tuae Israel’ (‘and for the glory of your people Israel’). The monumental work by Sheppard which concludes the present recording, Media vita, is a setting of an antiphon to the Nunc dimittis—beginning with the words ‘In the midst of life we are in death’—sung during the final part of the penitential season of Lent. The Nunc dimittis appears in chanted form in the midst of this vast polyphonic edifice. As is the case with so much of the liturgical polyphony by Sheppard and Tallis preserved in the Baldwin partbooks, Sheppard here builds his rich polyphonic textures and soaring lines around a slow-moving chant (in the Tenor part), but in Media vita the chant moves at half the pace that is common in such chant-based works by these composers, lending the piece its extraordinarily expansive character. The English delight in varied sonority is exemplified by the verses which follow the Nunc dimittis, the first two of which are for lower voices, while the last uses the characteristic English technique of gimell, dividing both the Treble and Mean voices into two, and supporting these just with the bassus line: this sound-world evokes—and surely evoked for John Baldwin—the musical splendours of the pre-Reformation church in England which his collection did so much to preserve.